In reading about natural cleaning products, I’ve come across a lot of women who are turning to natural beauty products as well. I was a bit reticent to try homemade, all-natural beauty products at first, out of sheer vanity. I will admit that to you. But the more I read, the more I knew I had to make the switch. One of the scariest things that I tried was deodorant. Yes, you read that correctly. I make my own deodorant. I have always thought that antiperspirant must be bad. I mean, sweating is a natural thing and plugging up your sweat ducts cannot be good. Turns out, it’s not. Most antiperspirants use an aluminum-based formula to clog pores, keeping those armpits dry. It seems like that’s bad, right? But let me tell you exactly what it does to us. When aluminum is absorbed into the body, it acts like estrogen. And estrogen promotes the growth of breast cancer. Many beauty products, deodorant included, also contain some form of parabens. Parabens are a preservative but they also can mimic estrogen in the body. Scary, right? Check out your ingredients lists. There are parabens in many products including shampoo, face cream, and body lotion. The Natural Cancer Institute has found no direct link between using deodorant and getting breast cancer. But I figure that if I can make my own, again for cheaper than what I pay for traditional deodorant, and have it work just as well, why not? I’ve been using the recipe below for the last three months. I wanted to wait until it heated up here in Southern California before I completely endorsed it. I wear it every day and I do not smell. I have not had a problem with residue on my clothing, even on expensive dresses that are tight on the armpit. Although this is not an antiperspirant, I don’t notice excessive sweating or the dreaded pitmarks. So here it is. I bought all of the ingredients at natural markets like Clark’s Nutrition or Sprouts. They can also be purchased online at Amazon.com. And once you have these products on hand, you can begin making more of your own beauty products, like face cream (recipe coming soon!). 1. 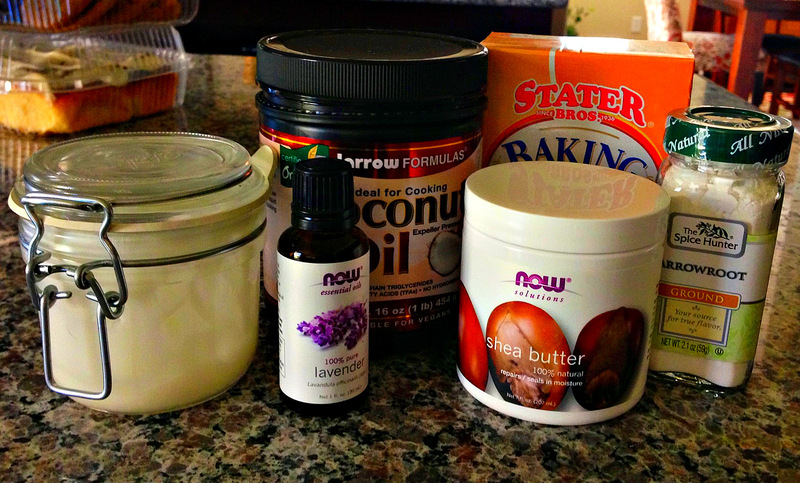 Melt Shea Butter and coconut oil in a double boiler over medium heat until barely melted. OR Combine in a quart size glass mason jar with a lid instead and place this in a small saucepan of water until melted. This will save your bowl and you can just designate this jar for these types of projects and not even need to wash it out. 4. Add a few drops of essential oil and pour into a glass container for storage. It does not need to be stored in the fridge. 5. Apply to clean armpits in the morning for an odor-free day! Did you buy deodorant jars or what kind of container do you use? I’ve been using Tom’s Lavender for a long time, and before that I used Mennen’s, which isn’t an antiperspirant but probably has parabens… Thanks for this recipe. I’m going to try it. I used a glass jar with a pop top. It’s on the very left in the picture. Let me know if you like it. And what’s the deal with the National Cancer Institute? Are they unreliable?? No, we agree. It’s why we do this! Apple Hill, Jen here. Dana talked me into this. Tom’s lavender did not work for me. This does! !